I have an obsession with Thai Boat Noodles. To me they are the pho of Thailand. I have made it my mission to try every place that sells them in Melbourne which isn't proving that difficult as they aren't the most common dish on Melbourne Thai menus. So far I have found them at only four establishments, Pad Thai in Midtown, Papaya Pok Pok in Springvale, iSpicy on Victoria Street Richmond and my latest discovery Thai Culinary on Elizabeth Street Melbourne CBD. No-one serves these in the way that I tried them in Thailand, I won't go into detail but if you are interested you can see my holiday post here. The Melbourne version is usually a single much larger bowl that you get at the boat noodle alley in Bangkok. Nonetheless I am just very appreciative that I can satisfy my boat noodle craving without having to travel to Thailand. 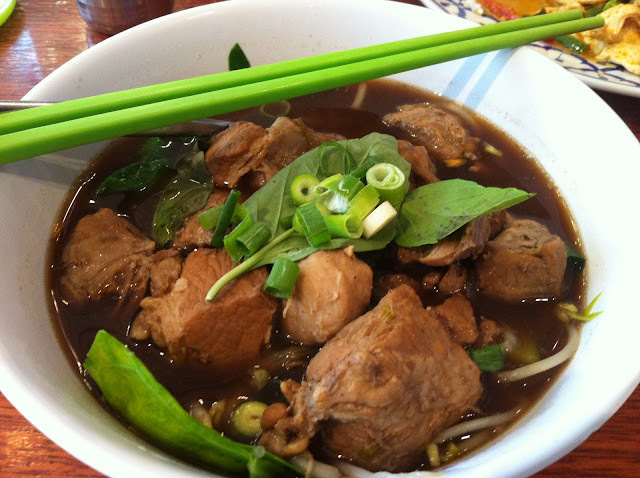 Basically boat noodles are a rich meaty broth with rice noodles served with pork or beef, pork balls and morning glory. Usually you also get a small container with four seasoning options, fish sauce, sugar, dried crushed chillies and chillies in vinegar. I go for lots of dried crushed chill, a touch of fish sauce and a sprinkle of sugar. Thai Culinary had been on my list for a while and I finally got the chance to check it out last week. I have to say that I was extremely pleased that I did. This was pretty easily the best version I have tried in Melbourne so far. A close second is probably Pad Thai where they serve it with delicous braised pork but they use more of a thinner (I think sen lek) noodle. By the way, don't be put off by the signage saying that it is only served on weekends, its served all week now and they haven't update the signage. The noodles at Thai Culinary was more authentic in my opinion, a thicker rice noodle that has a slightly chewy texture. The pork was quite similar to Pad Thai in that it had that fall apart texture that i just love, I think it was a different cut though as the Pad Thai pork often has a lot of rubbery tendon that I don't mind but to me it doesn't really add anything to the dish. The boat noodles broth is much richer and meatier that pho and slightly peppery, it is usually thickened with pigs blood although I'm not sure if they do this at Thai Culinary, I should have asked, I will make sure I do next time. I did ask at iSpicy and they told me that they do use blood, their broth was also fantastic as were the noodles but the pork let the dish down as it didn't have that fall apart texture that you get at Pad Thai and Thai Culinary. I could go on and on about comparing all the Melbourne boat noodle options but as I am certain I will be posting about boat noodles many more times I will keep a few things up my sleeve. If you want to know more, check out Kat's blog Spatula Spoon and Saturday or this awesome YouTube video about boat noodles by Migration Mark from Migrationology. So to wrap up, if you haven't tried boat noodles, get down to Thai Culinary (or Pad Thai) and give them a go. 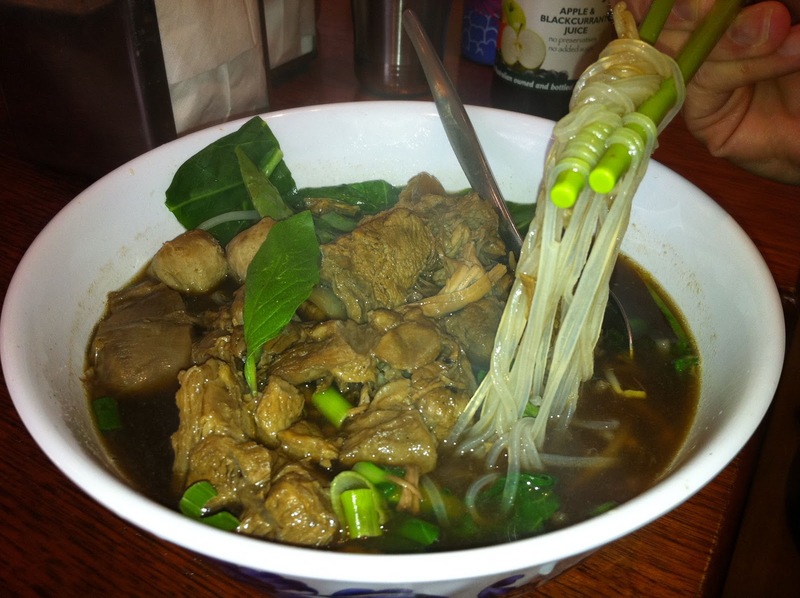 In my opinion they are far superior to pho and yet pho gets all the hype. For $8.50 at Thai Culinary with a choice of pork of beef you won't be disappointed!